Ten of the most well known spirituals are re-imagined with contemporary arrangements and ValLimar Jansen's brilliant vocals! After witnessing the incredible impact spirituals had in their presentations across the country, ValLimar Jansen and Tom Kendzia knew it was something that needed to be captured in the studio. The results are nothing short of spectacular. Ten of the most well known spirituals are re-imagined with arrangements featuring contemporary drum loops, keyboards and the "eSKape Singers" youth choir from South Kingston High School. ValLimar's brilliant lead vocals put the finishing touch on an infectious collection that will speak to listeners of all ages and all walks of life. 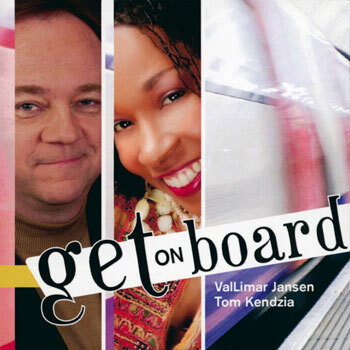 The title track kicks off the album with a joyful invitation for all of God's children to "Get on Board." "Wade in the Water" exudes a smooth jazzy groove and captivatingly intense vocals that never seem to rise above a whisper. A thumping drum loop serves as the heartbeat to the uplifting "Swing Low, Sweet Chariot." ValLimar's soulful riffing in "Glory, Glory, Hallelujah" will have listeners shifting from side to side and clapping their hands with this bluesy gospel anthem. An intimate percussion opening makes way to the delicate arpeggio of acoustic guitar. The choir anchors the steady pace of this song, while strings contribute an ethereal, ambient element. Effortless lead vocals playfully intertwine with each other, while piano runs and melodic inflections add dimension as the song builds through each key change. This collection masterfully honors the rich tradition of these timeless classics, while introducing them to a new generation of listeners to enjoy. Youth ministers: are you looking for a way to get the future of your parish excited about their faith? Look no further than Get on Board.